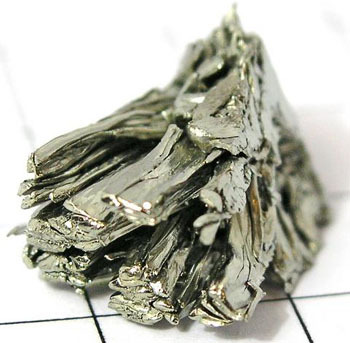 Scandium (Sc) is a silvery-white, metallic rare earth element and transition element found in group IIIB of the periodic table. It was predicted (as ekaboron) by Dmitri Mendeleyev and discovered in 1879. Scandium is widely distributed in low concentrations, and is extracted from thortveitite or as a by-product of uranium extraction. Scandium forms trivalent ionic compounds and stable ligand complexes. Chemically, it resembles the lanthanide series. It is used as a radioactive tracer and in nickel alkaline storage batteries. The refractory scandium oxide (Sc2O3) is used in ceramics and as a catalyst; dilute scandium sulfate solution is used to improve germination of plant seeds.